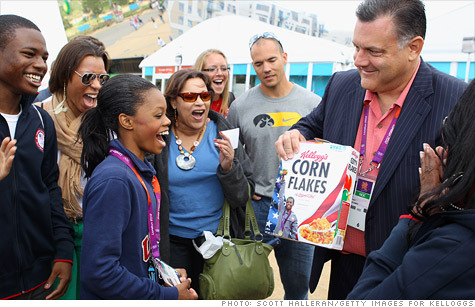 Gabby Douglas is presented with the first box of Corn Flakes with her picture on it hours after winning the gold medal in gymnastics. NEW YORK (CNNMoney) -- You won't be seeing Olympic gold medalist Gabby Douglas on a box of Wheaties. That's because Kellogg's has already swooped in and reached a deal with Douglas to put her picture on a box of Corn Flakes. The rush to get Douglas signed shows that she will likely be the big endorsement winner out of the London Summer Olympics thanks to her gymnastics all-around victory. "She's the new darling of America," said Bob Dorfman, executive creative director of Baker Street Advertising and author of Sports Marketer's Scouting Report. "She has the look, the great smile, and seems like someone who could be a compelling pitch woman of products to teens and pre-teens." Dorfman estimates Douglas could pull in between $1 million to $3 million a year in endorsements leading up to the games in Rio de Janeiro four years from now. But even if Douglas doesn't compete in 2016, her endorsement career could continue far many years -- or even decades -- to come. Related: Do Olympics cost too much for host cities? "In this particular event, there's proven to be a long shelf life," said Matt Fleming, senior account manager for The Marketing Arm, which arranges endorsement deals between athletes and advertisers. Just look at Mary Lou Retton. She appeared on a box of Wheaties earlier this year -- 28 years after she became the first American to win the all-around gold medal in women's gymnastics. Wheaties maker General Mills (GIS, Fortune 500) said it had no comment on its post-Olympics plans. The cereal company typically features U.S. stars on boxes of Wheaties. Two years ago, General Mills had Lindsey Vonn, Shaun White and Seth Wescott appear on Wheaties boxes after they won gold medals at the Winter Olympics in Vancouver. But Kellogg (K, Fortune 500) had an edge in signing Gabby Douglas, since the company is a sponsor of both the U.S. Olympic Committee and USA Gymnastics. Douglas won't be the only endorsement winner, however. The other American getting a lot of attention in London so far is swimmer Michael Phelps, who won his record 21st career Olympic medal when he captured his 17th gold on Friday. But the fact that Phelps has said he plans to retire from competitive swimming after the Olympics will limit his endorsement potential going forward, according to experts. Phelps' American rival Ryan Lochte, who beat Phelps head-to-head in an early event during these games but settled for the silver against him on Thursday, will probably be seen in more commercials, experts said. After all, Phelps reached his peak in terms of popularity after he won eight gold medals in Beijing in 2008. "People are a little tired of Phelps," said Dorfman. "We always want a new thing."